Creative JumpStart 2018 Is Here!! I'm over the moon excited to announce that I'll be participating as an artist in Creative JumpStart (CJS) 2018 again, run for the 7th time by Nathalie Kalbach. If you're not familiar with CJS, it's a one-of-a-kind online event to kick your creativity into high gear in January 2018. You get 31 Downloadable videos - over 6 hours of unique content - for just $40 (USD) if you sign up by November 29 11:59 pm EST, 2017. Afterwards it will be 45USD until December 31st, 2017 before it goes to its normal sale price of 50USD. I would love to see you this January at Creative JumpStart!! Creative JumpStart Is Here Again!! 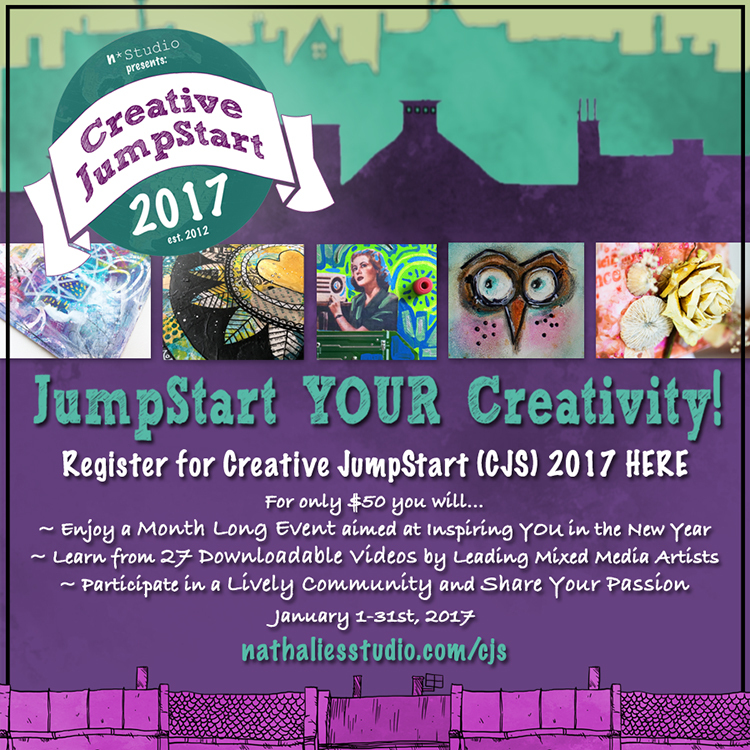 I am over the moon excited to announce that I'll be participating as an artist in Creative JumpStart (CJS) 2017, run for the 6th time by Nathalie Kalbach. If you're not familiar with CJS, it's a one-of-a-kind online event to kick your creativity into high gear in January 2017. It is also my 6th time with CJS and I can tell you that it is amazing and even though I didn't think it was possible, it gets better every year! So what are you waiting for? This is the moment! Sign up HERE!! Art Journal Summer School Is Here Again!! What is Art Journal Summer School (AJSS)? AJJS is hosted by Bloknote Academy. The goal is to keep you journaling over summer, not only at home but even during your vacation. We all know how hard that is, if only because of all the supplies you need to schlepp around while you're traveling. But here is the answer! A limited amount of supplies, fitting in a toiletry bag is all you have to bring. All teachers use merely the same supplies but all in their own way, combination and style. The colors may differ (which means you can use your own favorites) and maybe the brands, but the basics are all more or less the same. The course is spread out over 10 weeks. There are 14 teachers bringing you 21 short video lessons (about 12-20 min) filled with tips and tricks and instructions, showing you how to create beautiful art journal pages with limited supplies whether you're on the go or sitting in your garden enjoying the lovely weather. We don't want you to spent hours on the computer, we want you to journal! Click HERE to go to the store where you can find the supply list and more info. Then sign up and join the fun!! It doesn't matter if you're a beginner, maybe even haven't done any journaling before or if you're an advanced journaler. Whether you want journaling to be part of your daily life or just document your vacation. This course is meant to inspire and motivate ALL of you to journal over summer!! Course starts on July 1. There will be a new video up every Wednesday and Saturday for ten weeks. Lessons are downloadable. There will be a closed FB group to share and discuss and get to know your fellow students (but only if you want too ;)). Fun, fun, fun!! And even more fun if you can join for free, right?? I'm going to give away one spot to one lucky winner! How can you win you ask? That's easy! Leave a comment here, tell me why you think you should win and why you would love to take this course. Or, share this post on FB (tag me so I know you did!). Or go to my IG feed (BirgitKoopsen - follow me if you don't already) and repost my Art Journal Summer School picture (use #AJSS16Birgit) so I know that you did. Or do all of this and double, double, double your chances to win. I will pick and announce a winner by June 1. at noon (CET). And know what? You can just go ahead and register for the course if you want to take it anyway, that's another chance to win and if you win we will refund you your payment! Pretty awesome right?! AND… if you sign up before June 1. you will get a HUGE early bird discount. Pay € 75,= instead of € 95,=!! I have watched the videos that went up so far and they are all totally awesome. If you have not signed up so far, you still can! All 25 videos are downloadable and yours to watch forever! And let me tell you... This is soooo worth your money!! 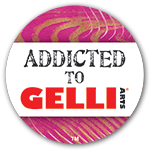 Check it out here and join us! Inspiration and fun guaranteed! Creative Jump Start Is Here Again!! Hello Jumpers Are You Ready For 2016?? Yes!! It's that time off the year again! I'm excited to announce that I'll be participating again as an artist in Creative JumpStart (CJS) 2016, run for the 5th time by Nathalie Kalbach. If you're not familiar with CJS, it's a one-of-a-kind online event to kick your creativity into high gear in January 2016. Throughout January participants (who lovingly started to call themselves Jumpers in the past 4 years) get 25 downloadable videos from 24 featured artists. I'm proud to be one of those artists, called “JumpStarters” for the fifth time! Head on over to Nathalie's site for more details and to sign up! Wanderlust 2016 - Teachers Revealed! Sign Up Now! Here it is! All teachers of Wanderlust 2016 are revealed. And oh my, what an amazing line up this is! So honored to be part of this adventure. A year long journey in art! Join me on this fun and inspirational trip. let's get messy together! Check out the video to see all the teachers. Click here to go to the Wanderlust website for all the info and to sign up. I would love to see you in class!! PS Thank you for using my link and therefor supporting me!! I am beyond excited to announce that I will be one of the teachers on Wanderlust 2016 (hosted by Everything Art), feeling very honored to be on this list of amazing teachers that I have admired for years for their original and inspiring work and their teaching skills. Wanderlust is a whole year long journey - an online event offering you videos from 24 guest teachers and 2 resident teachers one every week (each one downloadable and with PDF instructions provided), 50 amazing videos, which will run for over 50 hours in total, access to a forum with an amazing and friendly community, inspirations, challenges, discussions, galleries, workshops, giveaways and generous discounts from our partners. The perfect alternative to in-person classes! Teachers revealed so far are: Kate Crane, Teresa McFayden, Rachel Greig, Beckah Krahula, Joanne Sharpe, Flora Bowley, Mystele, Andy Skinner and Finnabair." Are you curious who else is on this list? Don't miss out on this amazing online event! Sign up today! Click here to go to the Wanderlust 2016 website!